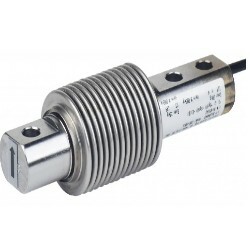 Cardinal CB6 Beam Type Bellows Load Cell features stainless steel construction, welded bellow seals, perfect for harsh environments, ideal for low profile platforms, hanging scales, hopper and packaging scales or other applications in the medical, industrial and process weighing fields. The CB6 bellows type load cell is a high performance, sealed bending beam load cells for use in low profile platforms, flexure bases, hanging scales, scale conversions, hopper and packaging scales, and a variety of other medical, industrial, and process weighing applications. Stainless steel construction and welded bellow seals make the CB6 available from Central Carolina Scale ideally suited for use in harsh and corrosive environments where routine wash downs occur. Easy to install and interchangeable with similar cells. NTEP legal-for-trade and OIML certified. Capacity options include 10, 20, 50, 100 and 200 kg.